The JAZZ uses the concept of active balanced headphone ground in which each headphone connection wire carries an additional signal such that the sum of the potentials of the wires equals zero. The position of its volume potentiometer is measured with the use of an AD-converter. The output of this converter is then used to set the proper volume level with a number of electronic switches. There are a total of 32 levels which allows for sufficient small step sizes and a very analog feeling. Natural sound at a reasonable price. I decided on the Corda Jazz after reading numerous reviews online. Key factors were the price and the inclusion of the cross-feed circuit. Purchased last month during their November sale for $265, shipping to U.S.A. included. I ordered on a Sunday and the amp was shipped the next day. It arrived ten days later. The amp arrived in perfect condition. First impression was that it's very well-constructed. It comes with a heavy duty power cord. Most of my listening has been with Sennheiser HD-650s. My only comparison points for the amp are the inexpensive Monoprice Desktop DAC/Amp and the headphone jack of my late 90s model Denon stereo receiver. My listening has been split between CDs and Spotify or Youtube. For online streaming via my laptop, I continue to use the DAC portion of the Monoprice amp. Compared to the Monoprice unit, the Corda Jazz offers a bigger soundstage and more powerful bass. The headphone jack from the Denon provides more power, and sounds very good with some material, but it makes the bass boomy and lacks detail. There are no such problems with the Corda Jazz. The word that comes to mind is natural. I've yet to hear harsh, fatiguing treble or an over-emphasis of any frequency range. I listen to a lot of indie pop/rock and a fair amount of 50s and 60s jazz. After adding this amp to my life, I predict I will be listening to more of the latter. Fitting, huh? Well, it's not because of the amp's name, but because of the inclusion of the cross-feed circuit. Early stereo jazz recordings are ill-suited for normal headphone listening because the instruments can sound as if they are pinned to one ear or another. Cross-feed lessens that problem. It's subtle, though. As others have pointed out, you tend to notice its absence not its presence. Probably the greatest compliment I can pay the Corda Jazz is that it moves me to dig out albums I haven't listened to in years. Holly Cole's "Temptation", a wonderful collection of Tom Waits covers, sounds beautiful through the HD-650s. It's an audiophile-approved CD that also happens to be a great album--a rare beast. Simply recorded with mostly acoustic instruments, it's just a stunner sonically. I was also impressed with the natural sound of The Birds of Bellewoods cover of Radiohead's "Idioteque", which can be found on Youtube. It's sort of an Americana-ish take on the song, with acoustic instruments only. Instrument and vocal separation was superb when using the Corda Jazz with cross-feed engaged. I've also used the Corda Jazz with the HD-650s for movie/tv programming. The sound is spacious and powerful, and seems to benefit from the cross-feed circuit too. Though most of my listening has been with the Sennheiser headphones, I did try the amp with my next-best pair, the Audio Technica m50x. These have deeper bass and are easier to drive to very loud levels, but have a somewhat fatiguing, "hard" sound that wasn't improved by the Corda Jazz. The last thing I want to mention is the volume control. I'd read that it's a high-quality design unheard of elsewhere in this price range. In practice, it does allow the sound to be balanced even at low levels. I listen mostly with the volume between 11 and 1 o'clock, but it sounds natural around 9 o'clock too. As others have noted, sound is still audible even with the volume set at the lowest point. However, the amp is dead silent when there is no input. My only quibble is that the volume setting is somewhat difficult to discern at a glance as the knob has only an unpainted dimple to indicate its position. So that's it. I'm very pleased with the Corda Jazz so far, and I suspect I will be enjoying it for many years to come. Paired with the Sennheiser HD-650s, it offers a luxurious listening experience. jaco61, natto and Haden2866 like this. I agree with pretty much everything the other reviews said, so I'll add how this compares to my Headroom Maxed Out Home (MOH). First, a little on the MOH I'm comparing with the Jazz. The MOH is a great amp: toroidal power supply, OPA627s biased class A, quiet background (high S/N ratio), linear, neutral sound. Power limited to about 250 mW and 250 mA which is plenty to drive just about any headphone short of a a HiFiMan HE-6. The MOH sound is smoother and darker than most solid state amps, yet despite being slightly dark it has incredible detail; it is not veiled. I used to be a tube guy (Wheatfield HA-2 driving HD-600s, a match made in heaven) and the MOH is the amp that converted me to solid state. In its day, the MOH cost a kilobuck or more depending on options and was on the Stereophile class A list. The Corda Jazz is very similar to the MOH; both are excellent amps and the differences are subtle. The Jazz sounds more neutral: not as dark, but not bright either. It's hard to describe, but "sweeter" seems to capture it. Sweet as in the sound of the strings in the 2nd movement of Rachmaninoff's 2nd played by Earl Wild on the 1960s RCA Victor LP. The Jazz is not as sickly sweet as that, the Jazz is too neutral for such euphonics but compared to the MOH its voicing hints in that direction just not nearly as far. Both are very neutral amps overall, but the Jazz leans sweet where the MOH leans warm. Compared to the Jazz, the MOH bass is a just a touch emphasized and wooly. Put differently, the Jazz bass extends just as deep but seems a touch more crisp. The MOH bass adds to its overall warmth and this is almost surely a contributing factor to the Jazz sounding less warm. It's almost impossible to describe this difference without exaggerating it; it's a subtle difference and I can't say I have preference; it's like two equally amazing yet slightly different presentations of reality. Both sound great and which sounds better depends on the recording. My LCD-2 (2014 Fazor model) headphones have deep linear bass extension and don't need the exaggerated bass so the Jazz pairs nicely. In the extreme high end (15 kHz +) , the MOH rolls off just a hint while the Jazz seems to maintain perfect ruler flat response. These frequencies are well above what would constitute "brightness", contributing more to a sense of space than of sound, they aren't in many recordings and even when they are they're hard to hear. I can't be completely sure this is exactly what I perceived though there was definitely a subtle difference and I believe this is what it is. Both amps have a headphone spatial processor, though the Jazz's is clearly better - more refined and subtle. The MOH dates from the late 90s and had one of the first spatial processors. It does work - improves imaging and reduces listening fatigue - though it bloats the bass (due to mono summing) and attenuates the upper mids / lower treble (due to comb filter effects). The MOH has a "filter" switch to give a 2 db boost around 1-4 kHz to counter the comb filter effects. I never used it for serious music enjoyment, only for casual listening and movies. The Jazz processor is a whole 'nuther thing. It does everything the MOH does (though it does it a little less, and here less is more), but with neither of the MOH's drawbacks and none of its own. It doesn't change the overall tonality or clarity of the music; it only opens up the image and reduces listening fatigue. Its effects are more subtle than the MOH, apparent mainly on natural recordings of acoustic music, which makes sense give what it is, and that's most of what I listen to. The Jazz has an adjustable gain switch that changes the level about 16 dB. I believe it swaps the metal film resistors that set gain across the op amps (instead of using fixed gain and attenuating the signal before or after the op amps), so it should be sonically transparent in either position. Low gain might measure cleaner (lower noise, wider bandwidth) but the differences are probably so small as to be inaudible and negligible. Any differences I thought I heard between low and high gain mode disappeared in level matched comparisons. The difference makes about a 1/4 turn of the knob. This enables it to drive pretty much any headphone under the sun. My LCD 2 headphones work well in both high and low gain modes, and after measuring the amp and speaking with Jan Meier, I use the high gain mode. Note: my LCD 2s are about 3 dB more efficient than Sennheiser HD-600s. The high gain mode is intended for normal use with full size headphones; low gain for earbuds, IEMs and high efficiency stuff made to be driven by phones. The Jazz has a very nice volume knob. The way Jan describes it, the potentiometer is not in the signal path, but it triggers relays to set the gain like a ladder stepped attenuator. This should be sonically transparent with perfect L-R channel balance at every setting. It's a very nice touch and simply unheard of in an amp at this price. The background noise on the Jazz is very low, but not quite as low as the MOH. On low gain at max volume it's dead silent. The loudest my ears can tolerate is around 3:00 and normal listening is around 12:00 so it's dead silent at actual listening levels. But on high gain at max volume there is an audible low level buzz/hum. The MOH gain is similar to the Jazz in high gain mode, and the MOH also has a low level buzz/hum at max volume but it's about 3 dB quieter. Either way, both amps are dead silent even at loud listening levels. To summarize, both amps take you close to the sound of the live mic feed but in slightly different ways. The MOH gives a slightly warmer, darker, smoother presentation. The Jazz gives a more neutral presentation with a touch of midrange sweetness. Ultimately I think the Jazz is closer to the live mic feed, but the MOH is a slightly more "musical" interpretation of it. No "better", no "preferrered", fully equal just different. Even if I ignore the modest $415 USD price, the Jazz is as good an amp as I've ever heard. The MOH cost nearly 3 times that 15 years ago and would cost even more if produced today. Given the price, it's the biggest pleasant surprise I've seen in audio for a long time and the best value I've ever seen. Addendum: I recently measured this amp, results here. It has excellent measurements to match its excellent sound quality. hopbird, hbuus and HuoYuanJia like this. I bought the Corda Jazz as a gift for a family member. I am trying it out with my own equipment for a few days before I gift it. Long story short: Excellent sound quality. Beats anything I've heard in the same price range (although admittedly limited to a few other head amps). No noise, no overtones, no drama, no artificial adjustments. This can always be debated, but it was transparent enough for me to notice significantly changes between different settings on my source, different headphones, well recorded vs. poorly recorded media, et cetera. I could not listen loud enough to cause any audible distortion with my headphones. Although I was physically at my limit so didn't try the knob all the way while listening to music. If anyone were so inclined to send me some headphones for review I would be happy to test with more demanding headphones and report back here. Yes it works. I have a Corda Classic in the mail so I will be comparing the more comprehensive crossfeed of the Classic vs the Jazz at a later date. As others have mentioned I noticed is does not always make a big difference. It works best on acoustic music from what I've been able to gather. This probably has to do with the way the music is recorded; such as real instruments being played versus synthesized. Overall, I find that I'm able to listen longer without hearing fatigue (especially a large difference with my closed phones used in testing). The crossfeed presents a more balanced and natural soundstage, instead of the annoying two mirror images that are easily distinguishable without using the crossfeed. Unlike non-Meier versions of crossfeed I've used I didn't notice any detriments to the sound quality while the crossfeed is active. I would be remiss if I didn't mention some cautions here: for sources with relatively high output (mine is 2 V RMS w/ unbalanced - I haven't tried the balanced but we can imagine what the effect would be), in combination with dynamic low impedance headphones with relatively high sensitivity this amp is not a good match - especially with almost anything recorded on CD past the year 2000 (notable exceptions from a few labels aside). Lookup loudness wars. With well recorded (non-bricked) source material it's not a problem, but for most mass-produced modern CDs even with the gain at 0 db and volume set to minimum the listening volume can get uncomfortably loud. I guess you could try to compensate with different RCA cables (but that would surely introduce other undesirable elements - I would rather have the cable be as transparent as reasonably possible without high capacitance). This is not a problem with the AKG K701's. It is a problem with Ultrasone headphones. The Corda Classic with - db gain setting would be more appropriate for Ultrasone headphones. From the other reviews I've seen I don't foresee this volume issue with high impedance or relatively insensitive headphones (maybe efficiency is the more correct term here) due to the SS design of the Jazz. Disclaimer: my hearing is a bit weird so maybe others may not have this problem at all. I've been tested by a doctor in an anechoic chamber to have an abnormally wide hearing range (beyond normal). This may contribute slightly to my experiences above. Packed well, double boxed, suspended internally with tight fitting blue foam. Build quality is perfect - especially for the price. It would be nice if the outer panels were a bit thicker like my Onkyo CDP (that thing is a tank), but this is a non-functional nit. Meaning... there is no vibration or any other issues and the panels are very sturdy. I was expecting the Jazz to get hot, but even after 5 hours straight of use it is merely warm to the touch. This might be because my headphones aren't pushing it hard enough. The gain button provides non-ambiguous spring-loaded action. The toggle switches which control the power and crossfeed functions provide a positive 'clunking' report. The volume knob feels analogue because it is (partially at least). No physical stepping clicks. With no music playing but power on, a soft electronic clicking can be heard when increasing volume past the 12/24 hour position. When music is playing at normal volume it is not audible. hopbird, Pratt and Syros like this. 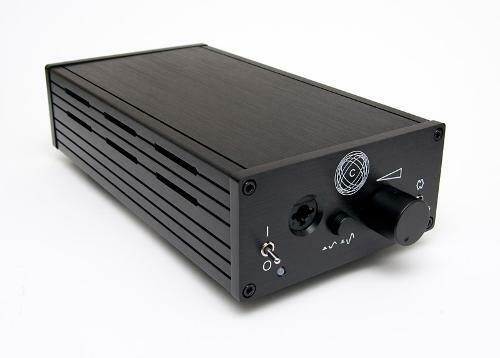 You can read my extensive review of this amp here. A short summary: If you are looking for a compact amp with a great build quality I can highly recommend the Corda JAZZ from Meier Audio. It provides a very clean, balanced and natural sound with a nice sound stage. The provided power will let you reach high volume settings for an unchanged sound experience throughout all frequencies.